Are you interested in Closing the Gap on Indigenous life expectancy? Do you want to be involved in an online Close the Gap storytelling event? Perhaps you thinking of joining Twitter but just haven’t got around to it yet? How about joining in a collaborative #TweetYan on Close the Gap Day 2014? Statistically I can expect to die nearly 20 years earlier than most of the people I am favouriting and retweeting. Indigenous Australians are 2.7% of the population, however this small minority grooup cannot expect the life span of the majority of the population. And if some people have their way, I should not expect to live any or all of a life free of hostility and abuse. Some prefer an Australia where some of us live on guard for abuse and must be prepared to fight back. But it wont be everyone who will be expected to be in robust debates on street corners, online and in print. Some can expect to never be targeted for hostility and persecution. But that hasn’t prevented a few from preferring that 'other’s' not be provided with the means for a life free of racial vilification and humiliation. And what are the effects of this? If you are a human being? They are horrendous. It will make you fear for not only your life, but your child’s and your entire family. It will make your workplace more stressful. You are vulnerable physically, and it will impact on your financial security. You will avoid using public transport. There are places you will not go because they are danger zones. Sporting events will provide reminders that Australia is a country where young and old will scream abuse and threats even if they have never met you, and they will do it for fun. 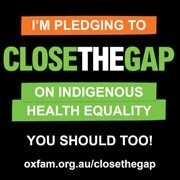 If your holding an event make sure you use #ClosetheGapDay! Thanks for all the support! To make Close the Gap Day memorable this year I’ll be looking for tweets that include the #CloseTheGapDay hashtag. I will also include selected tweets from my timeline. Our lives are intense, complicated & busy. Mob - sit in country listen to Mother Earth & allow spirit direct your future. “You may say I'm a dreamer, but I'm not the only one. I hope someday you'll join us. And the world will live as one” - John Lennon. If you want it bad enough, you'll find a way.